Cananga droatao is an evergreen arbor, and it enjoys another name �the tree of perfumes�. The tree is 10 to 20 meters in height; its blooming period is from May to November each year, the flowers are as large as 8 cm, which is yellowish green, and has very strong fragrance. The flower is a precious raw material for the perfume industry; the perfume distilled from it, �Yilanyilan�, is one of the most precious natural perfumes and high-rank fixatives; therefore, it is praised as �the champion in sweet flowers� and �the tree of natural perfumes� etc. Cananga odroata originates from Burma, Indonesia, Malaysia, and the Philippines etc. ; nowadays, it scatters in all tropical areas; we can see its cultivation in Canton, Guangxi, Fujian, Sichuan, Yuanan and Taiwan etc. in China. However, it is quite by accident when people first find it. In a May of the 1960s, a group of plant researchers were investigating plants in Mengla County of Xishuangbanna; one day, when they went close to a Dai village in the frontiers, a gush of sweet smells rose up; after they entered the village, they found the whole village was covered in sweet smells. The researchers felt quite surprised and they began to look around in the village. Later on, they found that each household in the village planted some tall trees in front of their bamboo buildings; the researchers went close to under the tree, they picked up some flowers and smelled them. The flowers were so sweet. They also found that the girls of the village pieced the flowers into bunches and wore them on hairs. Ardent Buddhism believers also placed bunches of such flowers into the saint water bowls and used it as sacrifice to the Buddha. The researchers collected the specimens of the plant; they consulted many relevant materials and determined that it was the world famous Cananga odroata. 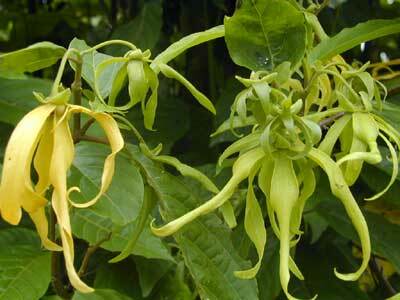 The discovery of Cananga odroata attracted the attention of many perfume factories. Afterwards, Cananga odroata was planted in large areas; and a base for the planting of Cananga odroata Cananga odroata was established in Xishuangbanna. Currently, the cosmetics and washes made out of Cananga odroata Cananga odroata come out one after another and they are sold very well on the market.